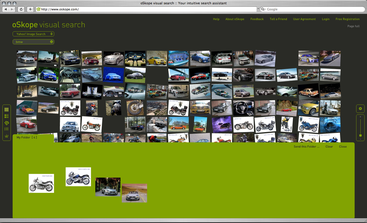 Offering up an increasing number of innovative ways to view web search results, Viewzi can help you look at things in new ways. Whether it involves searching using the 3x video feature or the timeline or snapshot views, Viewzi can give you a different perspective on your search results. Whitevoid's website does a nice job of maintaining visitor's orientation. As you move through the site, stacks of content unfold and as you move back up levels in the site hierarchy, they zip back up before you are taken to your destination. Engaging and informative. The work is strong as well. 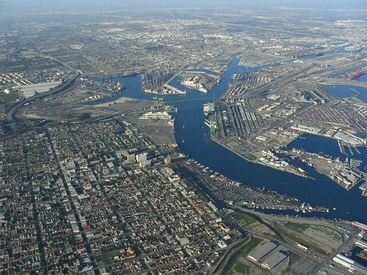 Thanks goes out to Martin Kay for the heads up on this one. Troika's playful Newton virus, which raises awareness of Apple's MacBook Pro built-in tilt sensor technology, is now being shown at the MoMA's Design and the Elastic Mind exhibition. The Tango!, an Augmentative and Alternative Communication (AAC) device created by Blink Twice, helps children who are speech or hearing impaired with communication and self-expression. Users create and customize sentences using touch screen pictograms and text. The device then reads them aloud. Vocabulary can be built upon through the use of a built in camera. 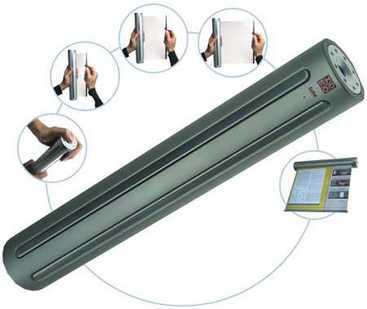 The device is also useful as a tool for teaching English. The device also has a USB connection for expanded functionality, CompactFlash, and SD, with the option to use a keyboard. Cellular conectivity is planned for later models. Current princes for the units are still very high at approximately $6899. Blink Twice hopes to get prices more accessible through meeting quantity orders in the future. This stylus based interface prototype allows users to browse, group, and manipulate file tiles in novel ways. One wonders how well the interface would actually stack up against current graphical user interfaces when more description file icon images, instead of things like generic PDF icons, were used. Still, the clever use of implied physics that the tiles have and the fluidity of the impressive prototype bring the BumpTop prototype towards the top of the pile in the bivouac interface hall of fame. 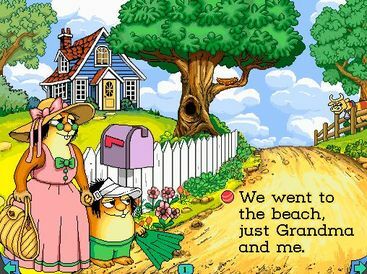 Thinking about the classic Broderbund title "Just Grandma and Me" reminds one of the simpler days of interactive media. Hypercard-like in its simplicity, this clever and engaging title leverages delightful animations and sounds which encourage kids to explore all of the nuances and details in the interactive illustrations. The written text of the story is interactive as well. Sentences can be read to children or they can click on those tricky words to have them sounded out individually. There are many learning websites for kids today to be sure. However, this title, produced in the days before SpongeBob Squarepants and the like, is notable for paving the way for all that have followed while keeping the quality bar high. There is little doubt that even Grandma would approve of this one. 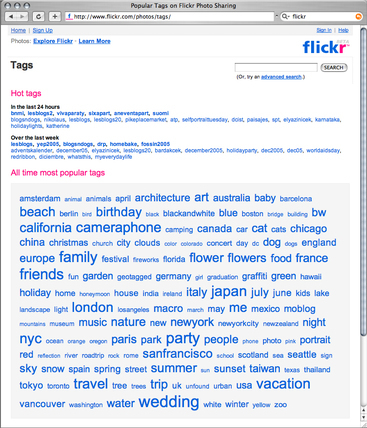 Tags provide an intuitive overview of what content is most frequently viewed. Also, by providing users with the means of creating and managing tags, they can be a community managed and regulated interface element. This entry makes it into the Interface Hall of Fame on the merits of its physical interface. The front ring of the camera can be rotated to close a white shutter. This clearly indicates to users the status of the camera, assuring them of privacy at a glance. 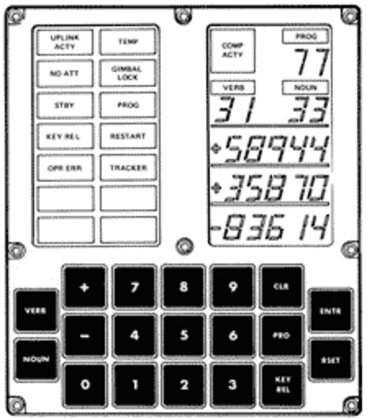 A classic collection of various interaction design touch points are represented in the Apollo Command Module main display console. Note how functional elements are grouped into zones. 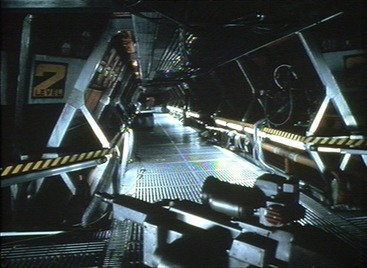 Controls were designed to meet military specifications and to be resist unintended activation by weightless astronauts floating about the Command Module. 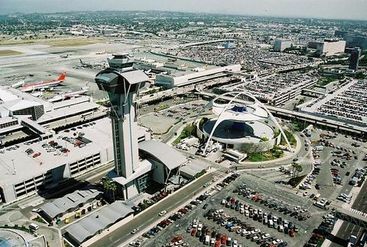 Also worth noting is the clever way programmers maximized limited computer processing capabilities available during the late 1960's. The Noun/Verb approach in the LED display area allowed astronauts to reference numbers from the display with an noun/verbal look up table to program their desired routines. 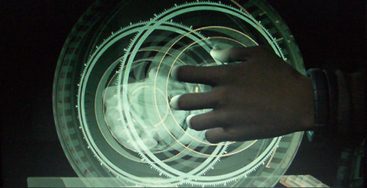 The Sony tiles interface research prototype offers and intriguing mixture of physical touchpoints and virtual functional modules. Thanks to Juho for the heads up. An essential entry in the Interface Hall of Fame, the HAL 9000 and its associated information displays remain impressive nearly 40 years after their creation. And that's no lie. Thanks HAL. 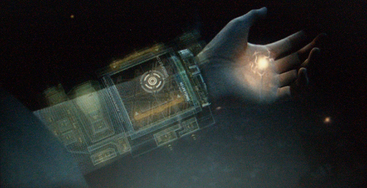 Another noteable interface featured in "Final Fantasy: The Spirits Within" is Dr. Aki Ross's wrist-mounted holographic display and controller. 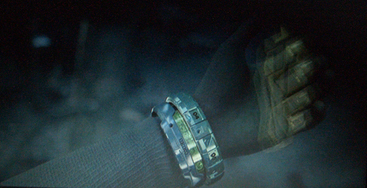 Note the Seiko brand placement in the rendering. While "Final Fantasy: The Spirits Within" was panned by many critics as being over-hyped and having an unsatisfying storyline, it is hard to deny that at a visual level the film certainly has its moments. And the "cast" has a host of compelling technology to tap into including Dr. Aki Ross's surgical laser complete with holographic interface. Check out the film if you are interested in animated features. There are some noteworthy vehicles, uniforms and fashions in the feature. 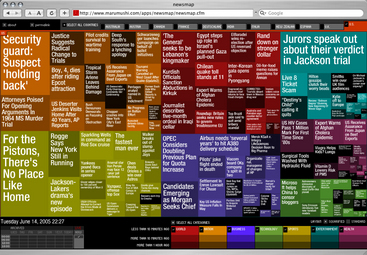 Notable for it powerful real-time visualization of the most popular news stories being read according to Google news statistics. This entry is often cited for simplicity and for getting the balance right regarding device vs. service interaction through the use of iTunes. 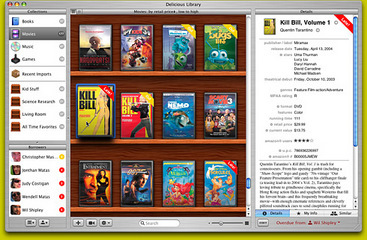 This is a combined entry including iPod and iTunes due to the power of their working in combination to keep device use simple and service encounters through iTunes rich and powerful. 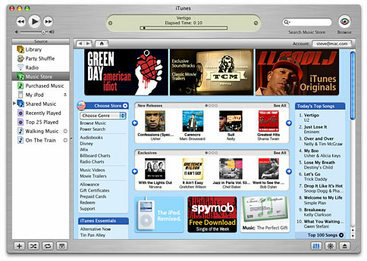 The version of the iPod's physical interface shown here is a particularly well-executed controller, keeping all key points of contact within the arch of a user's thumb and allowing for ease of use even while the interface is not being viewed. This entry makes the Interface Hall of Fame by being a good example of designing a clear interface for a theatre audience. 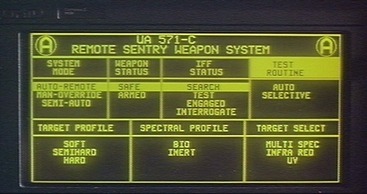 The remote user interface displays temperature, ammo levels and the fact that there are two sentry gun units are all conveyed through the interface helping to add to the suspense of the film. 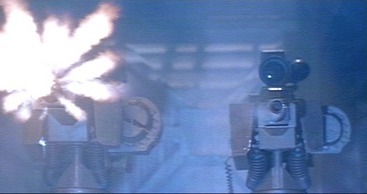 Remote sentry guns keep watch over an access corridor in James Cameron's "Aliens"
The interface conveys at a glance some technical capabilities of the Colonial Marines' weapon systems. Aliens receive a warm welcome upon entering the access corridor. Upon first viewing the Delicious Monster Delicious Library media archiving and tracking software (thanks to the heads up from Graham Hicks), I was left wondering who would ever really use a package like this. That same evening, I found myself frantically searching for all my books, DVDs and CDs to scan with an iSight camera for archiving purposes. This application features a rich user interface and represents a growing number of applications that are leveraging the internet (in this case amazon.com data) to associate with a users personal assets. When one scan an object's bar code or enter an ISBN number, the software accesses amazon.com and pulls relevant information on that item into the library automatically...including scaling cover artwork that appears on a virtual collection shelf...delicious. 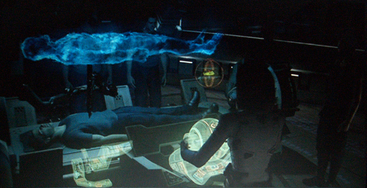 The HAC Flexible Display device enabled the team in Red Planet to overlay real time position information over the view of their surroundings to gain their bearings.The HAC units bear some resemblance to the Tube concept put forth by a team of designers from IDEO in their 2010 technology forecasting project conducted for BusinessWeek.